The Christmas celebration in the Philippines is the longest Christmas seasons in the world, starting as early as September and ending as late as January. While Filipinos are longing for experiencing a white Christmas out of Western cultural influence and the experience of the overseas Filipino communities, Christmas in the country is warm and tropical, a way to escape the cold in the north if you come to the Philippines during the winter. Filipino Christmas traditions are a unique mix of local, Hispanic, and American traditions. The Christmas season in the Philippines is a popular period to travel, and buses, ships, flights and hotels are fully booked. Malls are becoming more packed during the beginning of the Christmas season. The season's peak is from November, after All Saints Day, through Christmas and New Year. The Filipino Christmas season kicks off as early as September, the start of the "ber" months, when the Christmas countdown starts; houses may be decorated for Christmas as early as these months. The religious observances starts on December 16, the day the 9-day Simbang Gabi and Misa de Gallo begins, and ends at Epiphany. Some people also include the Feast of the Black Nazarene and the Feast of the Holy Child (Santo Niño) as part of the Christmas period. Filipino Christmas traditions differ by ethnic group, but they share common origins; most Filipino Christmas traditions are influenced by Spanish and American culture. Caroling may begin as early as October, where it overlaps with the old Filipino tradition of pangangaluluwa just before All Saints Day. Filipinos celebrate Christmas parties as Christmas draws near in December, when schools and companies will soon begin their Christmas and New Year break. Parols (star-shaped Christmas lanterns) and belen (Nativity scenes), traditional Filipino Christmas decorations, can appear along with Western decorations like Christmas trees and Santa Claus figures. September 15 - The 100 days to Christmas begins. December 8 - Feast of the Immaculate Conception, a day of obligation for Filipino Catholics, since turned into a national holiday. 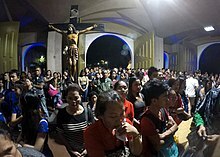 December 16-24 - Simbang Gabi and Misa de Gallo, culminating with the Midnight Mass called Misa de Aguinaldo. January 16 - Feast of the Holy Child (Santo Niño) and Sinulog Festival. The Filipino Christmas experience is further perpetuated by songs, many intended for overseas audiences who feel the nostalgia for the season. Christmas songs are played at the beginning of November, after the All Saints Day holiday period, and you can hear local songs, either in English, Tagalog, or another regional language, alongside popular Western hits like Jingle Bells, Last Christmas, Rudolf the Red-Nosed Reindeer and White Christmas. Ang Pasko ay Sumapit, a traditional Christmas song originally written in Cebuano, tells the Filipino Christmas experience in a religious motif. It is often played with Pasko Na Naman consecutively when broadcast in radio stations. Christmas in Our Hearts (1990), an English song by Jose Mari Chan, tells the common Filipino Christmas experience and the Biblical narrative. Pasko na, Sinta Ko (1986) by Gary Valenciano is a sentimental Christmas song in Tagalog, telling the experience of a man who misses his girlfriend on Christmas. Media network ABS-CBN produces Christmas music videos that are played as their station identification from mid-November until Christmas. Some hit station ID songs like Star ng Pasko (2010) and Thank You Ang Babait Ninyo (2014) have gained widespread popularity, and you may also encounter them in Christmas playlists by radio stations and audio systems in public places, and also performed live. Many cities and towns throughout the Philippines set up giant Christmas trees in parks and plazas. Shopping malls may also set up Christmas trees on large open spaces. Parol, or star-shaped Christmas lanterns, is intrinsically central to the Filipino experience; the facades of homes and churches are decorated by those during the season's peak. They serve as the local equivalent to Christmas trees, while also present in the Philippines, is not part of the local culture. Filipinos observe the nine days of Simbang Gabi (or Misa de Gallo), following the same Hispanic tradition. There is also the old legend that if you attend all the nine Masses, anything you wished will be fulfilled on Christmas Day. You can see children who sing Christmas carols from house to house, or performing live in public locations; just prepare some peso coins or bills to give them if you meet them outside. You may even encounter street children singing carols during traffic jams, going on stopped vehicles or hopping on buses or jeepneys, but it is inadvisable to give them any money. The Christmas season is also a major shopping period for Filipinos: flea markets, bazaars and shopping malls are filled to the extremes. Companies give their employees bonus money that they can use to shop. Major malls also host Christmas sales like in the West, but unlike there, malls and shops are open on Christmas day. Puto bumbong, a steamed rice cake dyed violet, is a Christmas favorite, especially during Simbang Gabi, where they are frequently sold. The Christmas season is also a season when pickpockets lurk in crowded locations; flea markets can be filled with pickpockets, who take the opportunity of the seasonal crowding to steal. New Year travel in the Philippines can be dangerous; locals light firecrackers and fireworks, that not only leave debris and smoke once day comes, but can inflict injuries if they blows on you. Rocket-type and triangle-shaped firecrackers, as well as the banned Piccolo firecrackers, are the most notorious causes of injuries; they also account for many New Year-related injuries, especially by children and youth. Fortunately, many local governments have been regulating the use of firecrackers, and in one example, Davao City has banned completely the use of firecrackers on New Year celebrations. This travel topic about Christmas in the Philippines is an outline and needs more content. It has a template, but there is not enough information present. Please plunge forward and help it grow! This travel guide page was last edited at 01:25, on 7 January 2019 by Wikivoyage user TagaSanPedroAko. Based on work by Wikivoyage users ShakespeareFan00, Ikan Kekek and Pashley.